Removes lots of irritating and repetitive dialogue. Single file or mix and match. This mod removes some repetitive and irritating dialogue from the game. It consists of a main file which contains all of the "adjustments" and several optional files which you can use instead of the main file if you wish to have more control over the dialogue changes. 1. Elven artifacts. 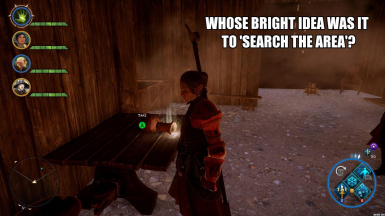 Stops Solas from commenting every time you get near to one of the Elven artifacts. He will still comment when you activate it. 2. Haven Blacksmith. Stops Harritt from commenting every time you access a crafting station in Haven. 3. Horsemaster Dennet. Stops Dennet from commenting every time you look at or change your mounts. 4. Lysette the templar will have her ambient conversation in Haven with the other templar: "See reason Lysette, we can't stay here..." only once per playthrough. 5. The crossroads merchant will no longer say "It's good to have commerce restored..."
6. Camping. Companions will no longer say "we could camp here" or other variations. Works in Jaws of Hakkon. 7. Blackwall's Memories of the Grey. The inquisitor will no longer say, "I think Blackwall would've liked to have been here." if he's not in the party. 8. Requisition Officer. If you have an active requisition, the requisition officer will no longer greet you when you go to camp. No more "Inquisitor." or "Nothing to report!". "We should search the area." This part of the mod disables all the companion and inquisitor comments that occur when your compass starts flashing. It will still flash, and do all the normal functional stuff. The help box will still pop up on screen the first time it happens in Haven as well as a couple of other times as usual (e.g. Chateau D'Onterre). The only difference is the absence of any dialogue. Read this excellent guide at DAI Modder Central. 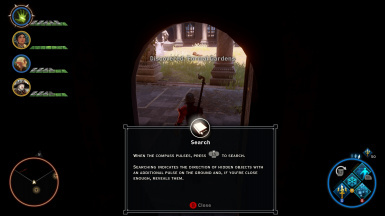 Please read these troubleshooting tips at DAI Modder Central before posting in the comments section if you have a problem. Any mod that alters the same dialogue. Thanks to the developers at DAITools for making great modding tools without which none of this would be possible. Thanks to tklivory for the great resource that is DAI Modder Central.